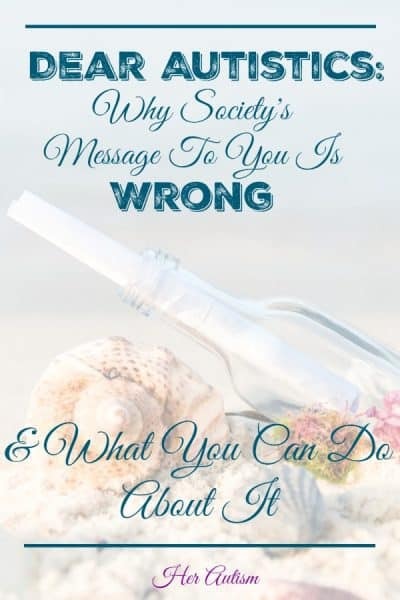 At our very core, our very essence, lie the messages we accept for ourselves, all too often as dictated by society. The power of right, encouraging, empowering messages cannot be overstated. By the same token, neither can the damage caused by wrong, crippling messages. Many, it seems to me, aren’t even aware of the messages they have heard, reviewed, and accepted. Turning this decision making process over to your subconscious is a mistake. Rather, knowing your messages and knowing they are right messages can be transformative. I sent my subscribers an email a while back about the messages society sends autistics. (If you don’t get these emails, I would like to invite you to join the Free Resource Library to get them!) The most common message I found? I have seen this message repeated in some form by all types of professionals and even by autistics. To some, the message may seem fitting for autistics, I would argue it is not healthy for anyone. There is nothing wrong with using available resources to be successful. Successful people use lots of resources all the time. I would argue, however, that it is wrong to tell people that without help they won’t be successful. Many somethings, in fact. 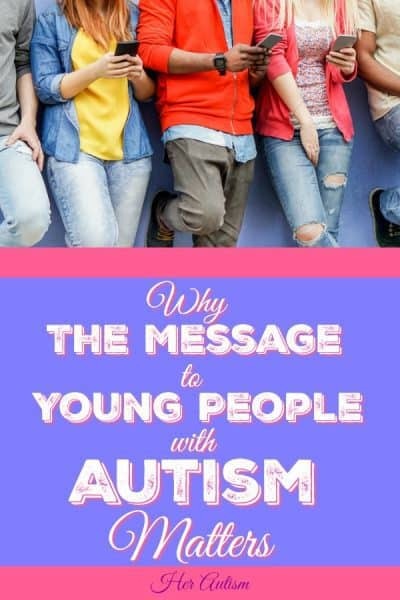 The message creates one more disadvantage for people with autism. How often do you see those messages in the context of writings or conversations about autism? Teaching some they need help while encouraging others to rely on themselves creates a disadvantage for those in the former group. An unnecessary disadvantage. A HUGE disadvantage. It suggests to people with autism there is something weak about using help and resources. Not so! In fact, the opposite is true! Using resources in the pursuit of success requires tremendous creativity and strength. We should be teaching everyone the skills of finding and using right resources! Do neurotypical people use resources to assist them in being successful? Yes, they do…all. the. dang. time. No one labels them “disabled” for doing so. Rather, if their efforts pay off, we applaud them for their resourcefulness. In my last job, I watched high level employees at an oil and gas company use coaches. Job coaches. Rather than losing respect, other employees envied their access to these resources! Brilliant entrepreneurs are always looking for coaches and consultants, tech folks, personal assistants, and more. Top athletes use dietitians, coaches, psychologists, etc., in maintaining their edge. No one, no one, thinks less of these folks as a result of their using the resources they need to be successful. And that is the way it should be. For everyone. It suggests people with autism should wait for the help and resources they need to be provided to them. That could be a long wait. It could even result in waiting in vain for help that is not coming. Worse, it could result in learned helplessness, codependency or other serious, harmful problems. The message of Walt? Go get it!!! It elevates the value of others above our own value. If we cannot be successful without those who claim we need them, they are indispensable to us. But, are they? Nope. There are lots of resources out there, and the vast, vast majority are replaceable. Are we indispensable to them? To the world? Not according to the message. According to the message we are needy and dependent. Not contributing and valuable. Ouch! It changes how we teach people with autism to find and use resources. Those who learn to fight for success are also taught to seek out the resources they need. In contrast, this message tells people with autism to find someone to help. Heck no! We should be teaching people how to identify that they need help and how to decide what kind of help. They should know that needing and/or wanting help is acceptable. They should also be taught to avoid undue dependence on others, not encouraged to seek it. I am reminded of Charles Krauthammer. I was a huge fan of his. He had so many health issues. Never once did I look at him and think that he could be successful if someone would help him. In fact, until someone pointed them out, I didn’t even notice his disabilities. The dude was so intelligent, so well spoken, I never noticed he had issues. He was just out there succeeding. No, he didn’t have autism, but he had plenty of other issues. I don’t think there was a morning when he woke up and lived the message we as autistics have drilled into us every day. Did he use help and resources? I would imagine so. It seems impossible that he would not have. Did he let that stop him from crazy success or right messages? No way! It suggests that autism-specific help and resources exist to help autistic people achieve success. Let’s be real. Scientists are still at the point of determining what autism is and how to diagnose it. 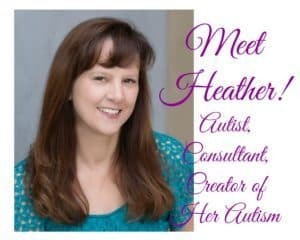 Therapies work to help autistics “fit in.” I am unaware of “autism” resources that propel autistics to success. The “experts” can only know what we know and even that is changing rapidly. In my own case, I wasn’t diagnosed until I was 44, so I never once used an “autism” resource. Did I use other resources? Oh, heck yeah! Anything and everything I could get my little hands on. Do I feel ashamed? No way! Am I glad I used them? You betcha! But, I grew up hearing the Walt Disney message and totally believed that if I could dream it, I could do it. I’m super thankful that this is the message I learned. I believe the difference in myself and those who learned the other message is tremendous. Back to the point, does the message exaggerate the availability of “autism” resources? Yes. Is that beneficial? No. It takes from autistics the credit for their success. I left this point for last as it is the most critical one. If autistics must have help to succeed then their successes are the result of the help and not their own at all. At least that is the message of the message. To me, that result is beyond acceptable. It lends credibility beyond that deserved by those “helping” us. Our accomplishments should be our own. Our successes should be attributed to our initiative, motivation, and efforts. Anything less is unacceptable. In addition, it tells the world that when an autist succeeds, they have no doubt had help in succeeding. Every part of me rebels at this notion. Spend some time in the coming weeks and months to listen and watch for these messages in your life. When you find one, determine whether you have accepted it and/or whether it’s the message you want to live. Am I seeing the results I want in my life? Do I feel that I could function on my own or do I depend on others more than I would like? Like your answers? Awesome. If you find messages in your life that you like, by all means hang on to them! Don’t like your answers? Take a look at the message. Ask yourself how you could change it and thus the outcomes you are experiencing. Don’t expect an overnight change. It takes time. Not a little time, a lot of time. 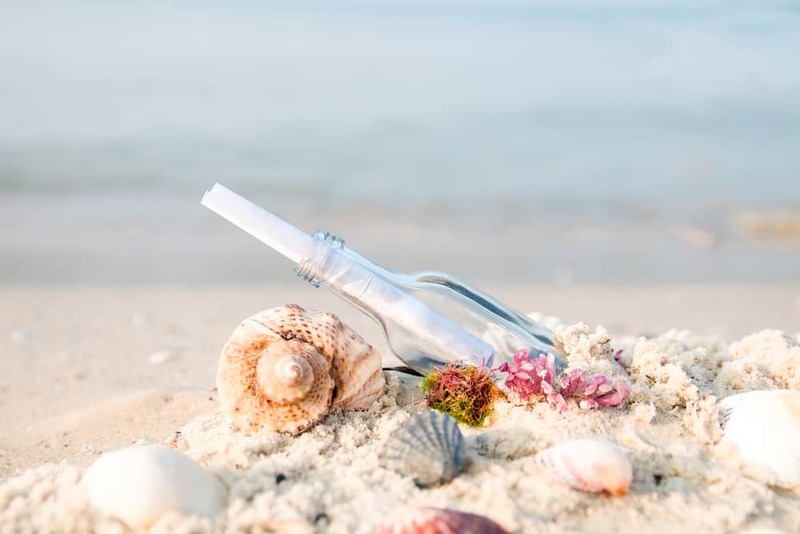 Write down the messages you have examined that you want to keep and add to that the new messages you want to incorporate into your life! Hang on to that list! No one gets to write your messages for you. You get to choose and write them yourself. But know this: It is okay to reject wrong messages. Be aware that rejecting messages you have been living may upset some of those around you. If you are suddenly less dependent on someone, for example, that person may feel like you no longer need them. This transition may be hard for both of you at first. And that’s okay. Letting go of old messages can be challenging to the point of being petrifying. Remember, fear does not mean change is bad. A little (or sometimes a lot) of fear can be a good thing. Don’t like your messages? Write them down on paper. Decide whether how you can rewrite them to better fit who you want to be and what you want to achieve. In the past, I have been underpaid for the work I have done. As a result, I am working to rewrite my messages about money. Like everyone else, I want others to compensate me appropriately for the work I do. I used to say to myself in regard to working on my blog that “I can’t do the tech work. I am no good at it.” Now, I hire it out and say, “I can’t wait to get past this issue so I can get on to adding more content!” It made no sense for me to make my self upset doing work that was not my strength when someone else could do it in minutes. Like many women with autism, I used to work hard to “fit in.” Society fed me the message that if I would just “do this” or “do that” I would be like everyone else. In crafting my messages, I try to make sure they are going to move me forward and leave little room for excuses. In addition, my messages leave room for using any resources I need. These criteria help me choose messages that are right for me. In rewriting your messages, you get to pick the criteria for what makes good messages for you. Once you’ve identified your messages, you apply them! It is not enough to have them on paper, you have to put them into practice. Ask yourself what steps you will have to take to transition from old to new messages. Find descrete tasks to get you there. If you find yourself falling into old patterns, no worries. Simply back up and try again! When your messages are right, you’ll wake up more excited to face the day. How awesome, right? Knowing that you are chasing right things for right reasons is energizing. Working to be more independent while still using resources will prove transformative! Goals become easier to set and easier to achieve. Best of all, your success will become your own!! The right messages are like this really cool abstract roadmap on your path to self-actualization, a path that hopefully you have already been on, but if you are about to take your first steps onto this path, good for you!!! You’ve got this, because you are enough. Just you. What message(s) will you live? 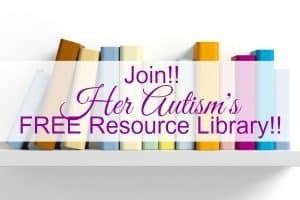 Want access to more autism resources?